If you’ve ever heard of kitchen sink cookies, they have a little bit of everything baked into them. 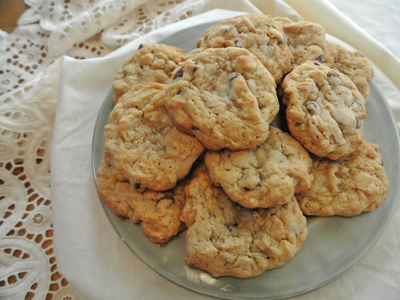 One might call these pantry cookies because it was the pantry that I went searching for something inspired. What I found was a leftover bag of chocolate chips, a jar of peanut butter and some oats. Any one of them would make good cookies but why limit my choices to only one when I could have them all? So I added a bit of each to my mix and the combination was a resounding YUM! 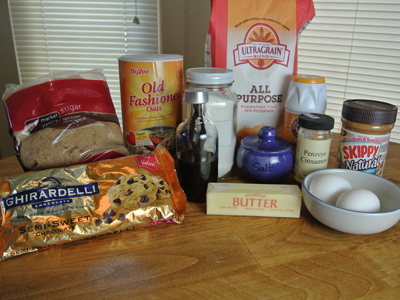 You’ll need some brown sugar, white sugar, butter, eggs, flour, baking soda, salt, cinnamon and vanilla. The good stuff includes some chocolate chips, oats and peanut butter! 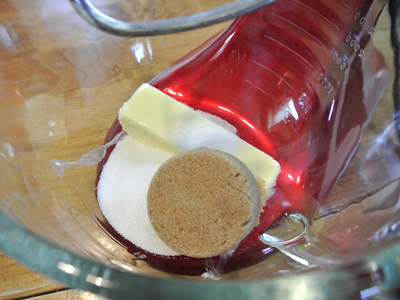 In a mixing bowl add the softened butter and sugars. Beat on medium speed to cream together. Combine the dry ingredients and add to the creamed mixture. Mix well to combine then add the eggs and vanilla to the mix. Now that the cookie base is made it’s time to add some texture and flavor. 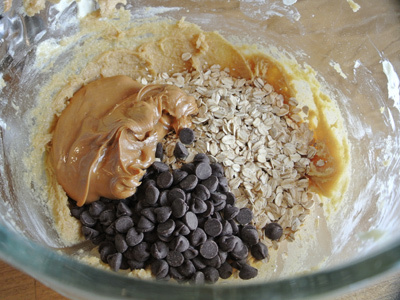 Add about 1/2 cup each of peanut butter and chocolate chips, plus 3/4 cup of oats. I use a small ice cream scoop to measure out dollops of dough. Bake at 375 degrees for 9 – 11 minutes. Preheat oven to 375 degrees. 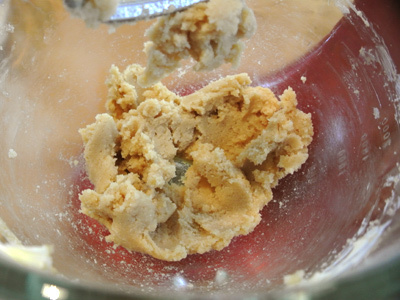 Cream together the butter and sugars with a hand or stand mixer. In a medium bowl mix together the flour, baking soda, salt and cinnamon. 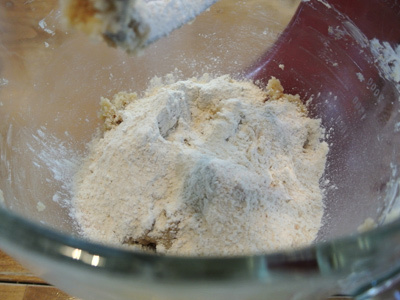 Add flour mixture to the creamed mixture and blend together until all the flour mix has been incorporated. Add the eggs and vanilla and beat on medium speed until the mixture becomes a doughy consistency. 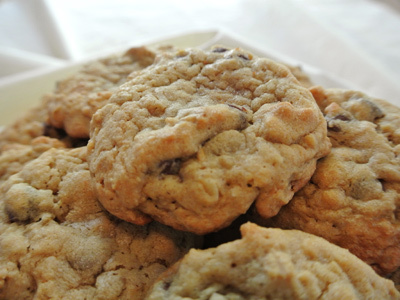 Fold in the oats, peanut butter and chocolate chips. 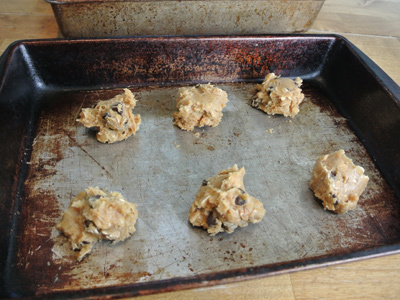 Using a small ice cream scoop, drop dollops of cookie dough onto an ungreased baking sheet. 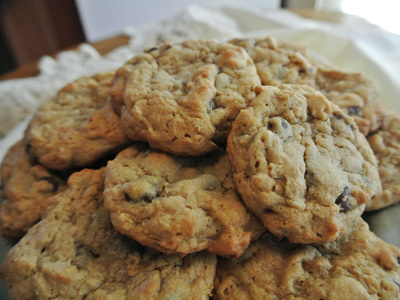 Bake at 375 degrees for 9 – 11 minutes or until cookies are lightly browned. Set cookies on a cooling rack for a few minutes to cool. Anything with chocolate chips gets my attention! Yummy yum yum! Happy Friday Jan! It’s hard to beat chocolate! You too, Anne! Have a good weekend!